The Solar Team is a group of high school and college student leaders who learn about renewable energy systems through hands-on projects, and teach our community how and why to go solar. The Solar Team will have primary responsibility for the SunBike, a mobile solar electric system in a retrofitted cargo bike. 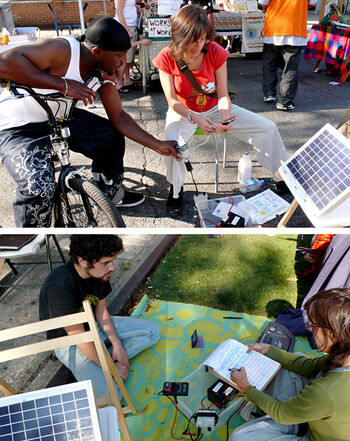 Solar Team members will help our neighbors use the SunBike for all kinds of “street power” needs, from outdoor film festivals and dance parties, to food vendors to community gardens and much more. If you are interested in learning more about Solar Team summer internships, contact SF Energy Solutions Project Manager Jocelyn Cohen, or call SF at (718) 208-0570.
hello! my name is paula sorrenti. i was at the herbal workshop today with sacred vibes apothecary and was interested in the work you are doing with the community garden. after looking through your website, i see that you have a summer internship program working with solar energy. i’m probably too late from it’s start but i was hoping i would be able to sit in on a workshop or somehow get involved in your projects since i am highly interested in creating renewable energy sources. hope to hear from you soon! thank you!